← Trekking Around Israel for a Month – Babywearing Style! My name is Guinevere Sande and I am wearing my 15 month old son Jameson in this photo. We were with my mom and my 3 year old daughter Brielle. We were visiting the San Diego Zoo for the day. I am using a size 6 linen wrap that I self dyed using a low water immersion technique. I recently switched to using woven wraps almost exclusively because of hip pain from using an Ergo. I love to wear my kids and I didn’t want to stop because of joint conditions! So I chose to do the research and switched to woven wraps. I do have some name brand wraps, but I enjoy making and dying my own wraps because it is more cost effective and unique to us. We were just leaving the zoo here and Jameson was being extra cuddly. He had had a grumpy day and the only thing that made him happy was being front wrapped on momma. I actually regretted not bringing a second shorty wrap and being about to tandem my daughter in a ruck because she was getting tired too. 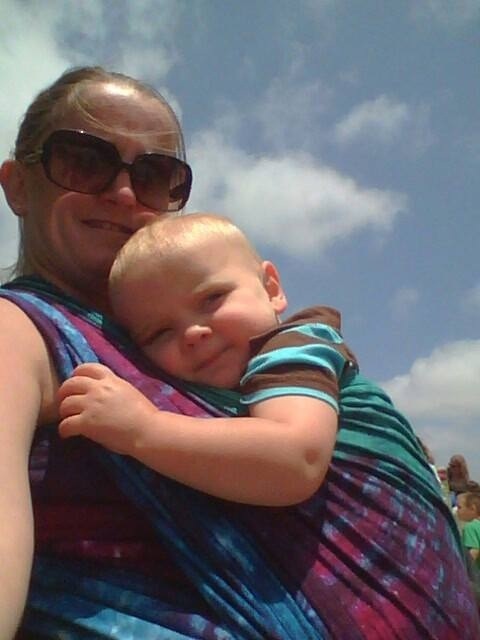 In general, I babywear because it keeps my kids happy and makes me a saner mom.